This is the beginning of my “be good to myself and inspire others” summer. As I’ve said, I’ve been feeling lost. My novel has felt far away. My friends have felt far away. Inspiration eludes me. Self-confidence has eluded me. Instead of hating this feeling of being lost, I am going to explore this world and try to embrace it and learn some lessons. And I am going to be good to myself while doing it–because I still have choices. I have the choice to eliminate the toxic. In short, I’m in a period of self-imposed rejuvenation. I know a little about what is toxic to me; when I was at a writing colony, a Famous Writer came to dinner each night and announced her word count. That alone paralyzed me. It made me feel AWFUL, and it smacked of competitiveness. And Facebook is replete with news like that from my network; word counts, publishing data, industry data. Because Springtime is the time when writers receive literary acceptances to such things as litmag publications, fellowships, conferences, scholarships, etc., it’s been toxic to my writing process and to me. So I logged off of Facebook. (Okay, I will confess here: not entirely, because I’m still addicted to Farm Town–! That in and of itself is kind of a problem, but to my credit, I do skip my newsfeed and go straight to Farm Town). Silence is good. One thing that struck me was Elizabeth Stark’s video, which made the simple yet brilliant statement that support is key to finishing a book. I didn’t have enough support. And I had plenty of road blocks. So I’m removing those roadblocks. I’m off Facebook, but I’m also spending some time with myself and doing things that make me happy. I know that the teaching semester isn’t over yet (tomorrow, my students turn in their final papers and we have a potluck in class to celebrate our achievements!) and I have plenty of grading to do, but I’ve made a conscious decision to begin winding down now. This semester has EXHAUSTED me. I’m sleeping in. I’m sleeping a lot. I’m sleeping tons, like I did when I first arrived at Hedgebrook. And instead of feeling guilty like I did then, I’m understanding that it is a part of what I need to do as a writer. I’m going to all my favorite places, especially those that inspire me. I’m stunned I haven’t visited one of my very favorite places in the Bay Area, the Fitzgerald Marine Reserve, in nearly 15 years. I used to frequent those tidal pools on a weekly basis during one of the blackest periods of my life, and I used to stare at all the life teeming in the crevices of rocks and in tidal pools, in awe of life’s tenacity. 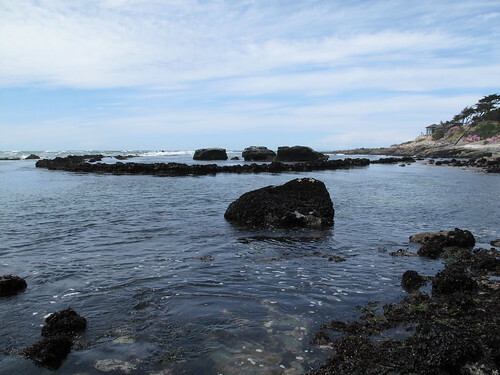 A tidal pool habitat is one of the most extreme in the world; the waves constantly pound life and for a few hours each day, the water completely leaves the inhabitants exposed to the air. And yet they survive, and survive well. They have all adapted to this harsh environment. It was totally inspiring to me, and I would sit there on the beach and contemplate this for hours, and derive strength from everything before me. This time around, we sat down and held hands and celebrated our 11th marriage anniversary, feeling more blessed than ever. Those waters and that habitat helped me, again. 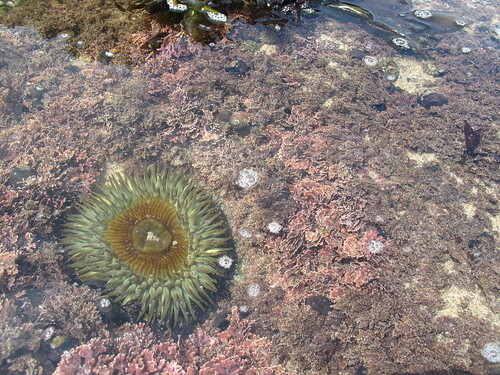 The tidal pools are not the same as they were 15 years ago–instead of many starfish, I spotted one, and no brittle stars and only one tiny sculpin–but still, the myriad anemones and turban snails and hermit crabs were still there, weathering the elements (one of the elements included a family that was actually EATING them straight off the rocks), and persevering/living their lives. Oh, and the best way to watch a tidal pool? Be still. Be very still and wait. I am cooking delicious meals again. Over the weekend, cod en papillote atop peashoots with a light mirin sauce). 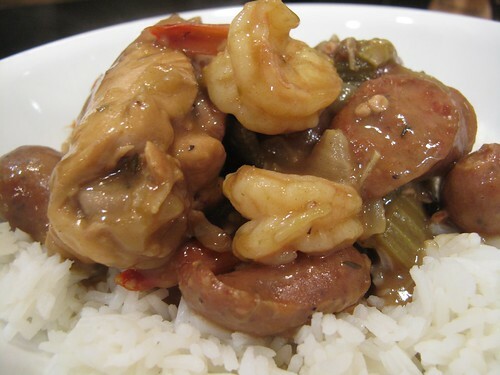 Crawfish boil a couple weekends ago, and then crawfish etouffee. 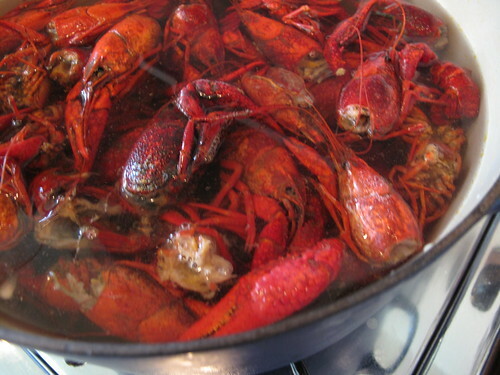 This weekend, I made stock from all the crawfish heads from the boil (I stuck all the shelled heads and tails in the freezer after the boil). I also made chicken stock from a carcass in the freezer. Is it weird when I say that making stock makes me happy? The slow slow simmer rendering the flavor from meat and bones into a clear broth gives me such satisfaction. I like that the discards become the foundation for something new. 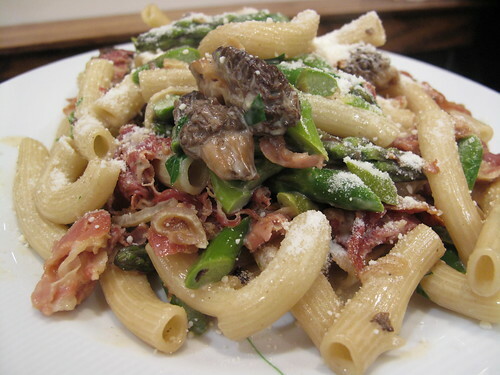 Last night, I made a rigantoncini with morel mushrooms + asparagus + shallots in a cream sauce (using Samin’s rigantonicini from the Pop Up General Store, and adapting their suggested recipe). I totally forgot to add chives and a chive flower from the vegetable garden. But seeing that (single) chive flower in the garden made me happy this morning. 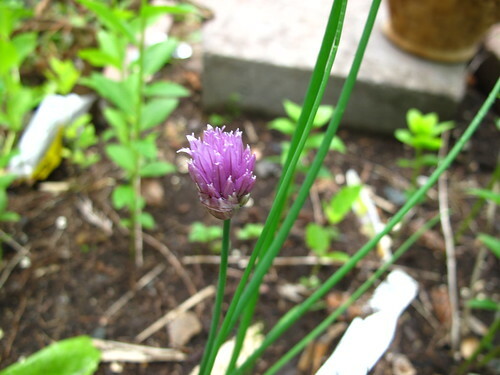 Speaking of chive flowers–I’ve never gotten any of my chives to flower before (hence the single flower). So that’s sweet. I bought mangosteens, thanks to my friend (whose blog is a ghosttown) who gave me the heads up about their appearance in a not-so-distant grocery store. And while there, I spotted them: fragrant pears. I filled a bag. (I have to go back for more). Deliciousness. Deliciousness is important to my happiness, and it is important to my psychic health. Deliciousness inspires my tastebuds and in turn, deliciousness inspires me. I spent some time sitting outdoors on our patio, reading, writing in my journal, and eating homemade salsa. It was nice to spend time outside, in the shade on a temperate day, with a breeze tickling the hair on my forearms. Whatever pollen is flying through the air isn’t bothering me; my allergy season is over. The resentment and envy has left me and my person, thank goodness. I hate feeling envious–and I see it as an alarm warning saying, “There is something awry in your world, Christine.” There is a quote by Craig Ferguson who said, “Someone once told me resentment is like drinking poison, and expecting someone else to die.” Hence, my immediate decision to detox. I had drunk some kind of poison, and I need to take care of myself. And refill with inspiration and love and support and kindness and energy and joy. I know, I’m not the kind of person who likes chanting in a yoga class, because I feel it’s too “hippie” but there you go. I’m decompressing, being still, being with myself. 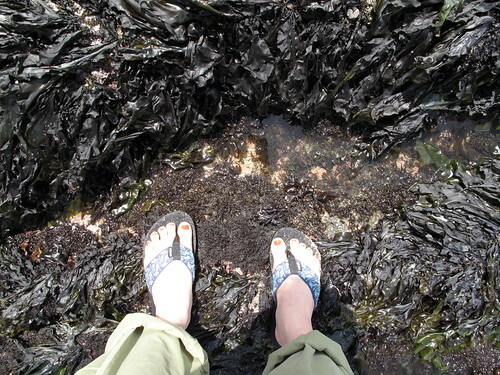 When I was emerging from that Black Period nearly two decades ago, one of the many things I had difficulty with was being by myself, and being still (hence, why I’d go to the tidal pools–knowing that in some way, all the creatures were keeping me company). But in the end, that very ability was the thing that saved me. There is still heartbreak happening in the world. For starters, the oil slick in the Gulf is now viewable from a NASA satellite…from OUTER SPACE. And there seems to be no end in sight, despite assurances from BP. But–I’m going to start with being good to myself. Or else there will be no goodness coming from me.